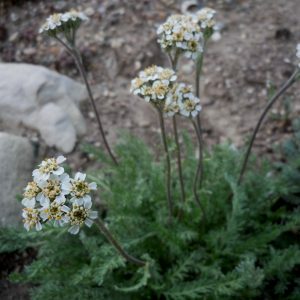 White flowers over grey-green foliage blooms for nearly 2 months in summer. Frilly ivory pearls flower all summer and fall on this cottage garden classic. 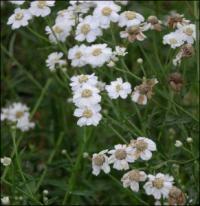 Named “sneezewort” because its flowers reputedly caused sneezing. English brides carried A. ptarmica at their weddings and called the plant “Seven years’ love.” (After that, you could use Lobelia cardinalis to cure the 7 years’ itch.) Cultivated in Europe since the Middle Ages and in America since the 1700’s. The double form ‘The Pearl’ described as “‘The Pearl’ is a pearl indeed,” May 1905, The Garden. 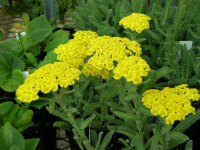 Lemony colored flower heads from June to September, wonderful, wooly foliage. Good in front of the border or on rock gardens. Grown in English gardener Tradescant the Elder’s garden 1630. “A splendid plant with fern like foliage and rich golden-yellow flower heads.” H.H. Thomas, 1915. 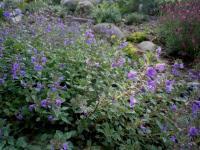 Common name for its aromatic foliage. It has been used to reduce excessive sweating and fever. Also, leaves may be brewed for tea.